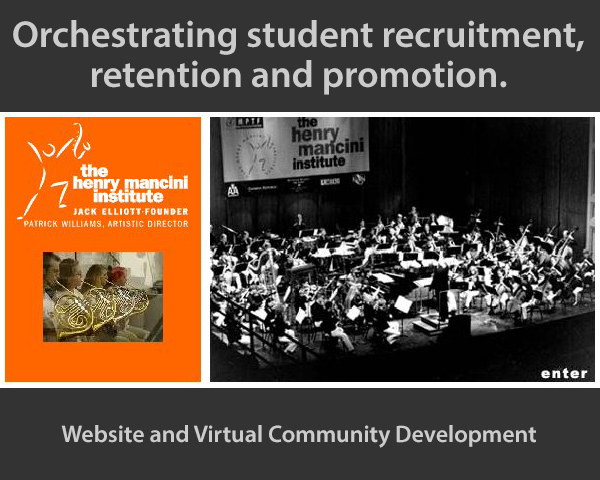 The Henry Mancini Institute – Website and Virtual Community Development | ASTRALCOM - Content Strategy, Conversion Marketing and Customer Acquisition. The Henry Mancini Institute – Website and Virtual Community Development | ASTRALCOM – Content Strategy, Conversion Marketing and Customer Acquisition. In today’s hyper-competitive world, it was a primary concern of the Mancini Institute to further their outreach efforts and provide valuable post-curriculum services to the Mancini Institute alumni. The Mancini Institute students were from around the world and maintaining contact with the alumni and between alumni was a challenge. ASTRALCOM was called upon to help orchestrate a student recruitment, retention and promotion platform that enables students and musicians from around the world to interact and experience each other’s career advancement and to promote themselves to the world. ASTRALCOM, in concert with Mancini Institute, developed a comprehensive virtual concert hall wherein Mancini Institute staff, students, guest artists and composers could showcase their musical talents, announce performance dates and show times, collaborate and maintain contact with other Mancini Institute staff, students, alumni and the public. The Mancini Institute’s online presence was a customized, fully integrated CMS/CRM model that helped automate and streamline many functions within administrating and maintaining a large member-based web presence. Giving your audience the tools they need to do their own thing is what user-generated content (UGC) is all about. Learn more about UGC at this link and let us help you help your audience.